Dies design & making--After receive order of eye nuts, we will arrange production right away, die design and making is the first step. Such eye nuts dies are designed with CAD & Solidworks software, then machine die steel block using our cnc center. Thus to get the upper and lower dies. Drop forging--Drop forging is the key step for manufacturing eye nuts. After heating steel round bar (usually used material is 35# or stainless steel) to certain temperature, they will be pressed between to upper and lower dies to get net shaped products. Machining--After forging, machining is still required, we will machine the thread hole (normally UNC in the bottom of eye nuts for better fitting with drop forged eyebolts. 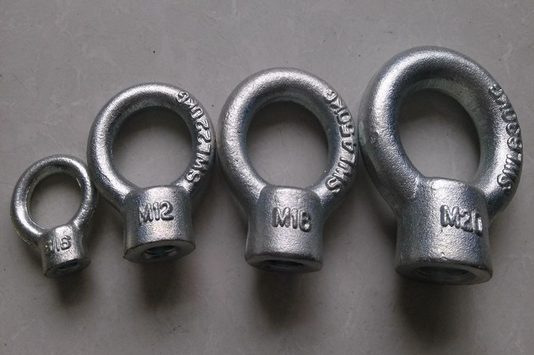 Surface treatment--For drop forged eye nuts made in carbon steel, they are normally required galvanized or zinc plated. Of course, inspection of drop forged eye nuts is also very important. We should ensure that the products are regularly inspected and that the inspection should be done in accordance with the safety standards given in the country of use. This is required because the products in use may be affected by wear, misuse, overloading, etc. During using process, users should take in mind that Inspection should take place at least every six months and even more frequently.